Heads or tails? Left or right? Yes or no? “To be or not to be?” In life we are faced with endless questions, choices we must make. Will those choices determine your fate? Maybe you believe that your life is mapped out for you, that you have a destiny, and no matter what choices you make or actions you take, your life will turn out exactly the way the universe has designed for you. Or maybe you believe that you are the master of your own fate, that you have complete control and create your own destiny. Or maybe you have only more questions, because how can any of know how this whole thing truly works? In William Shakespeare’s play Julius Caesar, Cassius says, “The fault, dear Brutus, is not in our stars but in ourselves that we are underlings.” Thus begins a plot to assassinate Caesar, and we all know how that worked out. Ambition is a two-sided coin. On the one side, it is a positive trait to be motivated and work hard and fight for your dreams. “Rolling stones gather no moss,” as they say. However, the other side of the coin of ambition is that it often has the power to corrupt. History and literature are full of stories of ambitious people who do underhanded, evil, destructive things in order to get what they want. Turn on the news for five minutes today and you will see that these stories are not confined to the past. So, dear “friends” of Hamlet that they are, Rosy and Guildy go about plotting to find out what’s got Hamlet moping about and acting looney. Now, are they really his friends who want to help him, or are they ambitious underlings who are taking their fate into their own hands to make their way? 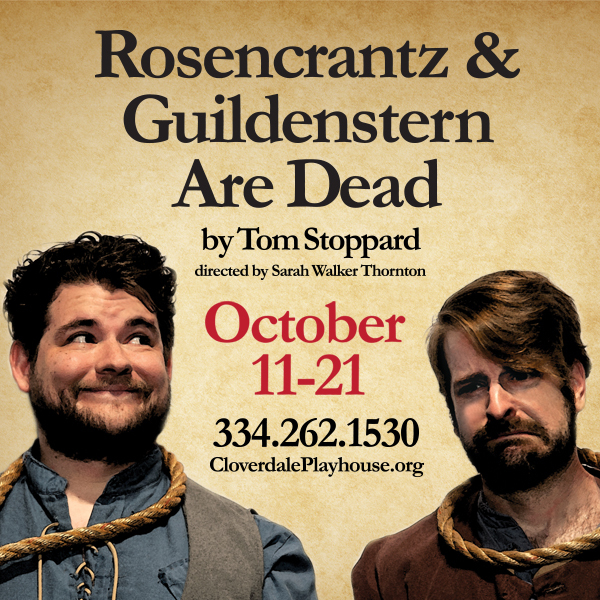 If you haven’t read or seen Hamlet, I wouldn’t want to spoil it for you, but the title of the current production at the Cloverdale Playhouse may give you a hint of how all of this works out for little Rosy and Guildy. Tom Stoppard, who is considered one of the greatest living playwrights, took Hamlet and flipped it on its head to explore the story from these minor characters’ perspectives. Combining the plot of Hamlet with the meta-theatrical style of Beckett’s Waiting for Godot, Stoppard creates a brilliant play about life’s questions. He explores choice versus destiny, life verses death, action versus idleness, chaos versus order, and on and on. He raises so many questions, both for his characters and the audience, and offers no answers at all. Brilliantly, Stoppard also manages to make all of this questioning incredibly funny. We watch these characters struggle to understand their purpose, trapped as they are “passing time in a place without much visible character,” and the randomness and ridiculousness of their situation is filled with comedy. Comedy and tragedy are two sides of the same coin, after all. Thursdays-Saturdays at 7:30pm and Sundays at 2pm.